Stick a fork in me, I'm done! 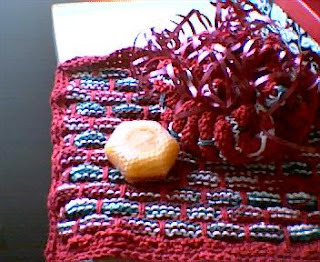 For a couple of close friends, one of whom always feeds my cats when I'm traveling, I made some Christmas-themed washcloths out of Peaches & Creme yarn. And since both ladies like fancy-shmancy soaps and such, I got some honey/milk soaps at a booth at the Christkindlmarket earlier this week. I decided to use the cloths themselves as the wrapping paper for the soaps. I just ran a ribbon around the edge, pulled it tight, and tied it off. I'm very pleased with the way they turned out. what great gifts!!!! when do you leave for NY? Oh, I've already been and am back now. Last weekend was the early Christmas in NY. I finished my bro's hat in the nick of time, just as the plane touched down. He really liked it. My SIL loved her scarf, and so did my nephew. He kept trying to take it away from her. He's at the "It's MINE!" stage of the terrible twos. I like the idea of using the actual cloths as packaging. Hi, MooseGirl. Thanks for commenting! I got the idea of using the cloths as the wrapping paper from Mitsuwa Marketplace, a Japanese store in Elk Grove Village. They sell beautiful wrapping fabric. The idea is that you use it over and over, rather than buying paper and then throwing it away.